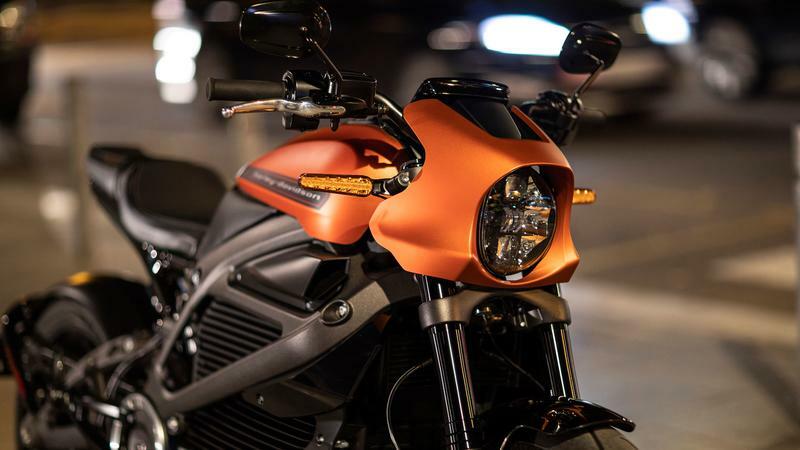 While there are still a lot of unknowns about the LiveWire, Harley-Davidson has recently updated some of its specs, as they have finally begun testing the production model. These new figures include improved range, quicker charge times and better acceleration. Harley still won't disclose the size of the LiveWire’s battery pack but the new figures are better than we expected. Previously the range of the LiveWire was set at 110 miles in the city, but that has now been updated to 140 miles. Using the latest riding range test procedure, the company has disclosed 88 miles of combined range for highway and city riding. For comparison's sake, the Zero SR has a mixed city/highway range of 120 miles with a 14.4 kWh battery. Charging options have also improved and for those who want the quickest recharge, the LiveWire is now compatible with standard DC fast charging. As a result, the bike can now be charged up to 80% in 40 minutes and up to 100% in an hour. Additionally, all dealers who carry the LiveWire will have Level 3 chargers on site. Through the H-D Connect Service, owners will also be able to access information on their bike via the cloud using the latest version of the Harley-Davidson app. Monitoring battery charge, estimated range, bike location, and service reminders can all be done remotely. It even features a built-in security system that will notify you if the bike has been tampered with or moved. Sure the 88 miles of mixed range isn’t great, but 140 miles of city range should be fairly sufficient for most urban riders. As the LiveWire is an entirely new platform for the company, we expect there is still plenty of room for growth. Adding DC fast charging was a much-needed improvement and should help the Livewire to better compete with other electric bikes already on the market. I do worry that real-world numbers will end up being much less than these estimates though. Once Livewires are hitting the road in good numbers I bet most people will find it easy enough to find somewhere to charge. Automakers have big plans for the early 2020's which is impacting a lot of other industries, after all that's hundreds of billions, if not trillions being spent just within the next few years on going electric. The infrastructure isn't really an issue for the Livewire as most owners will simply charge overnight at home. The electric range is going to severely limit the kind of trips people take with this bike though, and most will probably restrict it as an inner city commuter. It would be smart for the Livewire to take in account the battery state during your commute and set a trip that passes by charging stations, similar to what Tesla's do. That kind of technology can go a long way in putting owners at ease in terms of range anxiety. With that they should create an App to allow for remote function. That way we can better manage the Livewire and delve more into the whole technological experience these bikes are supposed to bring. They already have that with the HD Connect Service, it details the features in the article. Anyone looking to take the Livewire on longer bouts, will have to pre route their trip, as any EV owner does. But with Ionity, Telsa, Chargepoint etc infrastructure is increasing quickly. There is a lot more support for EV's in Europe than we are seeing in North America. Not only with the availability of charging stations but incentive programs as well. That should change as more established brands come on board with new electrics. Energy companies based in North America will eventually pressure governments to offer incentives as they get more involved in electric vehicles. All that big money has influence that stretches far and you can bet it means influence on that side of the industry. As more EV's come to market, the entry level price should start to decrease as brands attempt to compete with one another. The government wont have to incentivise buyers once there are more approachable options to choose from.